Look out! 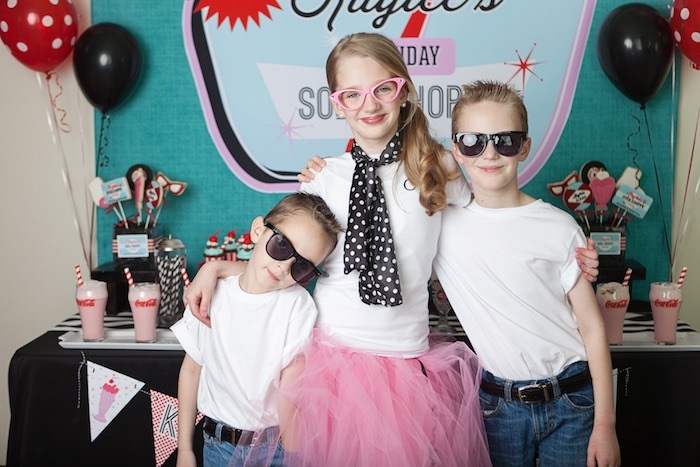 Were headed back in time– to a place filled with sock hops, roller skates, and lots of fun–the 1950s! 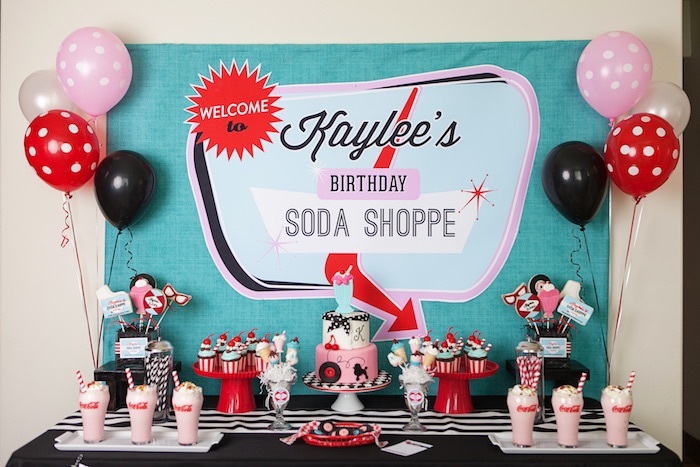 With that said, I give you this adorable Retro Soda Shoppe Birthday Party submitted and styled by the incredibly talented Jennifer Carver of Banner Events out of Puyallup, WA! 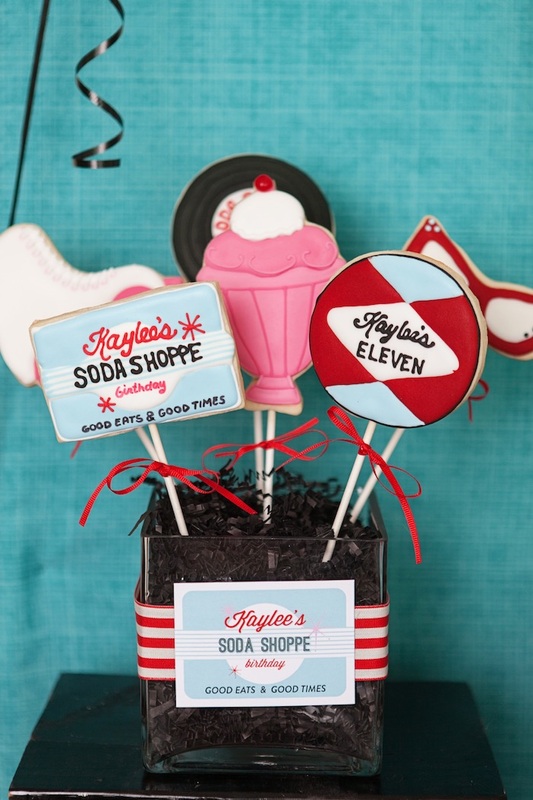 Its custom sweets, retro stationery and eye-catching decor + details are sure to have you swooning and swaying with envy and delight. 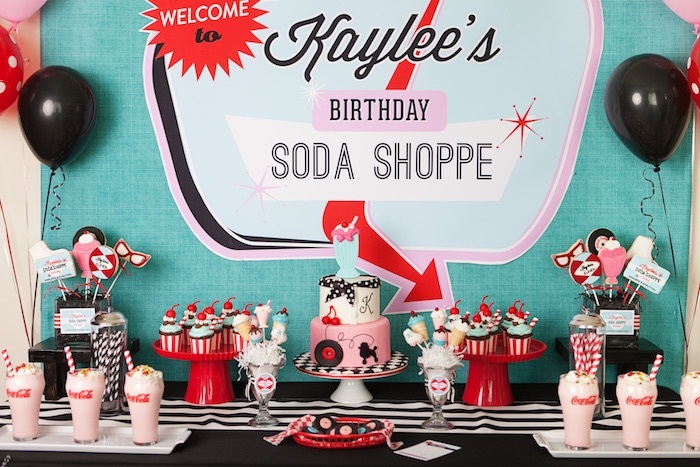 This is what Jen shared about the party- “I am excited to be flashing way back to the 1950s for this fun retro soda shoppe birthday party I created for my daughter’s 11th birthday. 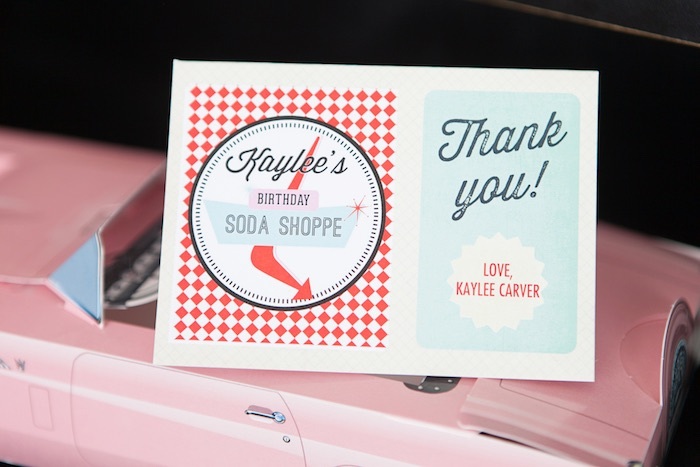 The talented Maureen of Anders Ruff Custom Designs worked with me to create from scratch an entire diner/soda shoppe inspired invitation and printable collection which provided the framework for my styling. 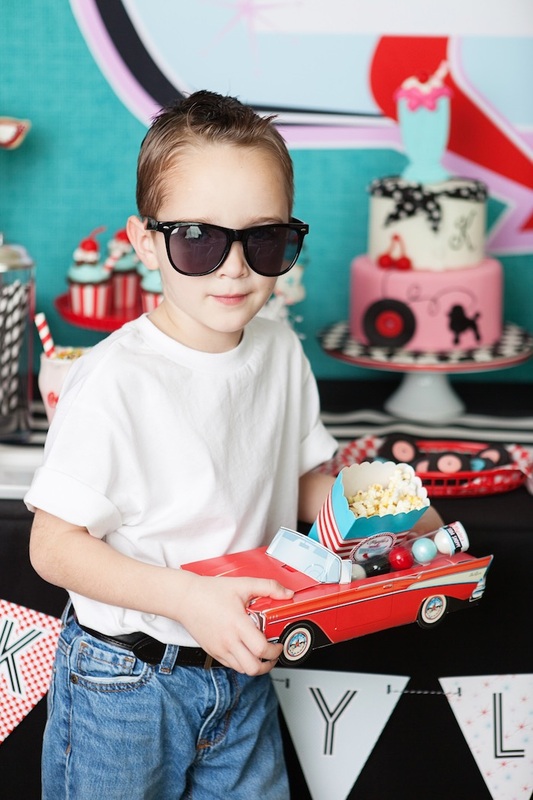 I hope you dig the 50s style outfits & hairstyles, retro inspired menu–including an amazing sock hop cake– and all of the classic décor which we all love from the 50s. 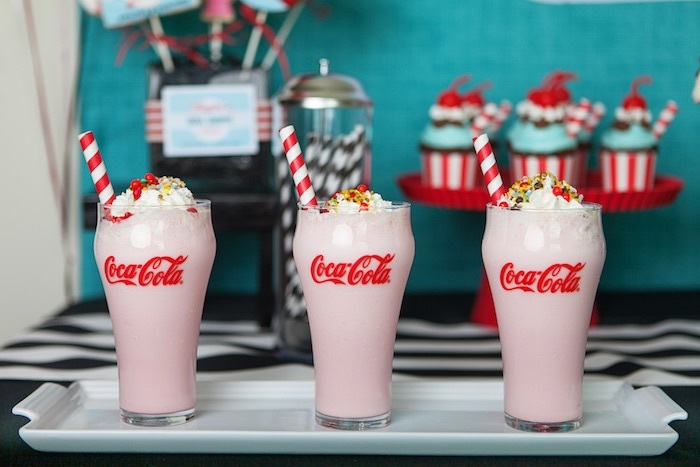 Grab your favorite milk shake, pull up a stool and enjoy the photos by A Fresh Take Photography. 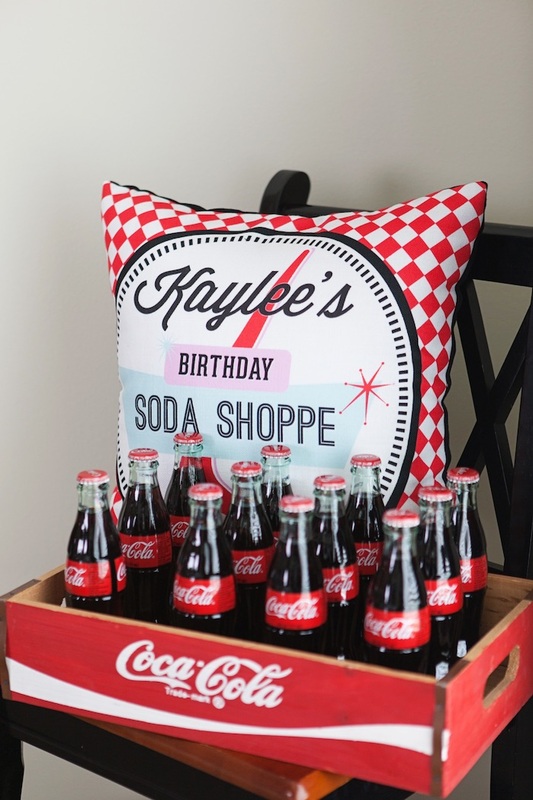 I’m a huge proponent of guests having both a say and a hand in planning their own birthday parties. 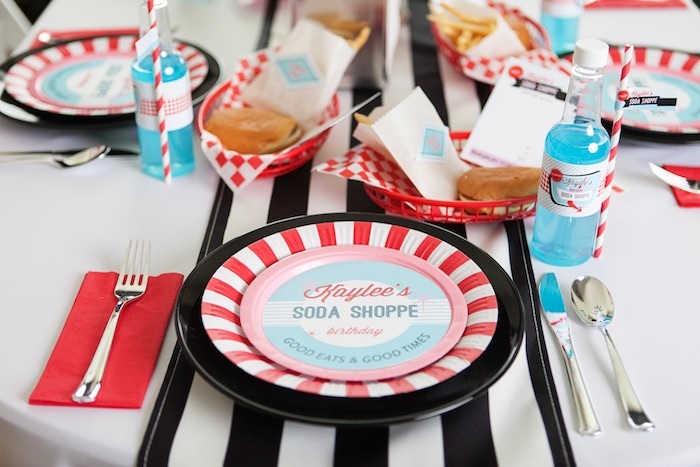 Everything from the theme, color palette, activities, menu and decorations should be about them and represent things they love! 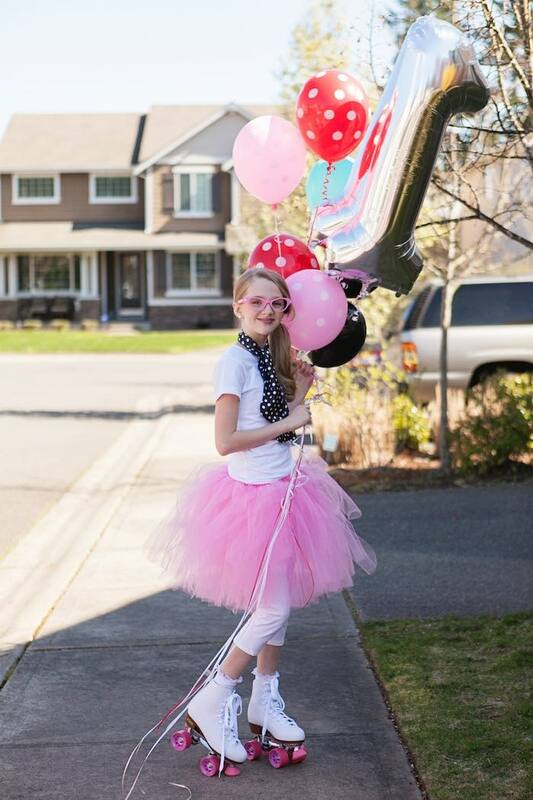 About 9 months ago, my daughter expressed interest in having a roller skating party for her birthday, which sounded like a fun idea! 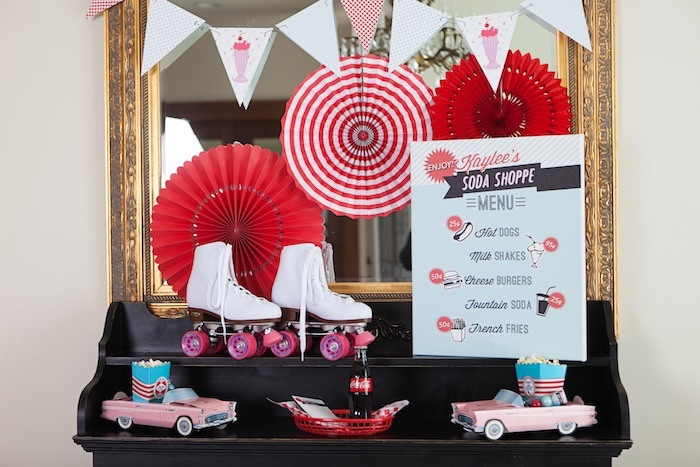 A few months later she followed up with a fun twist to the roller skating idea, suggesting we take the party theme back to the 1950s with poodle skirts & a diner & soda shoppe style menu. 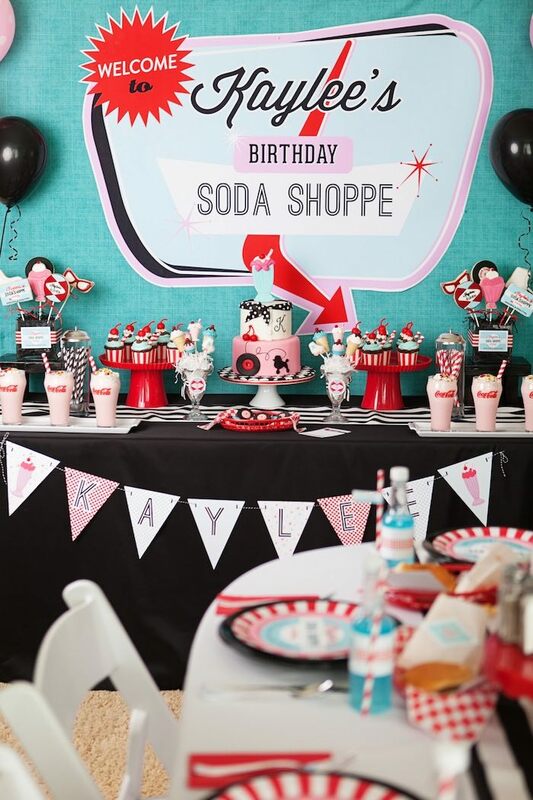 I loved the idea and began conceptualizing this retro soda shoppe birthday party with her requests in mind. 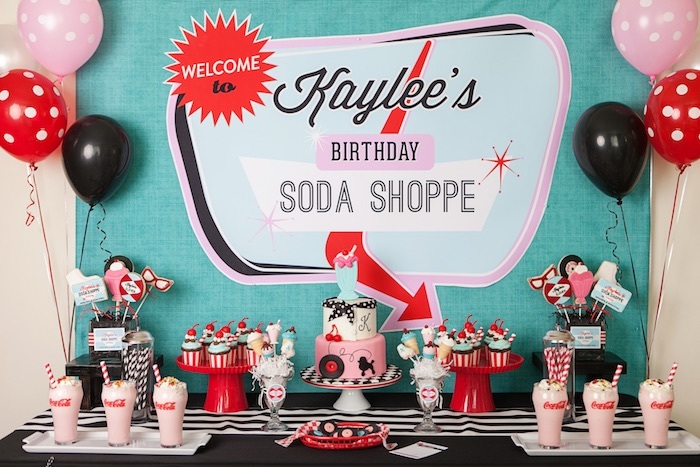 If you follow my parties, you know that the first step in establishing my party theme & concept involves the invitation creation. 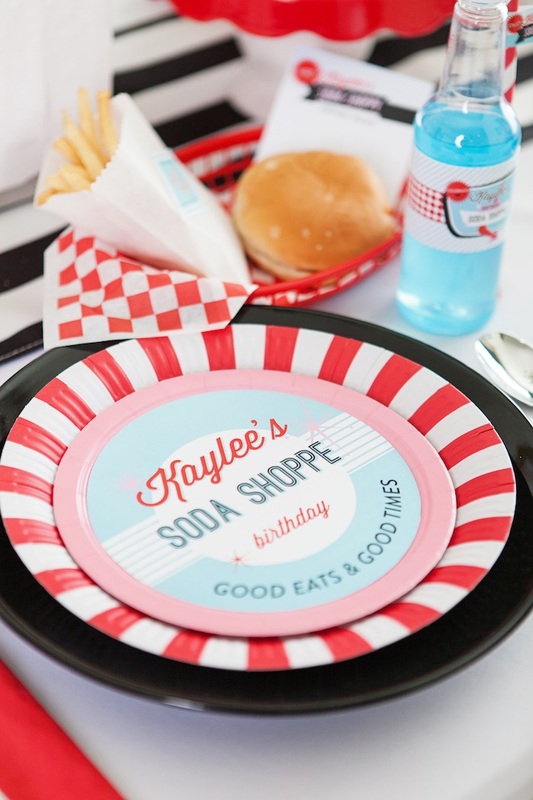 Mixing the classic aqua, red, black, white and pink colors from that era with the retro inspired diner signage, Maureen amazed me again with the invitation design! 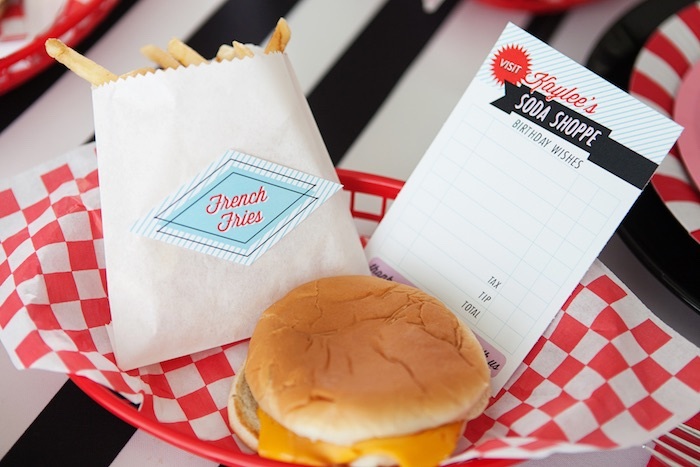 I love the red checked border, common on the food paper lining burger baskets from the time. Perfection! 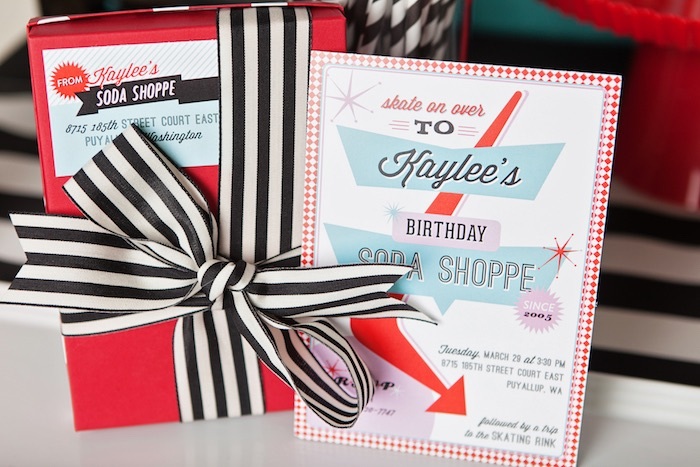 Thank you to Driftwood Printing for their incredible, vibrant printing on the invitations and all of the coordinating items you see featured in this party. 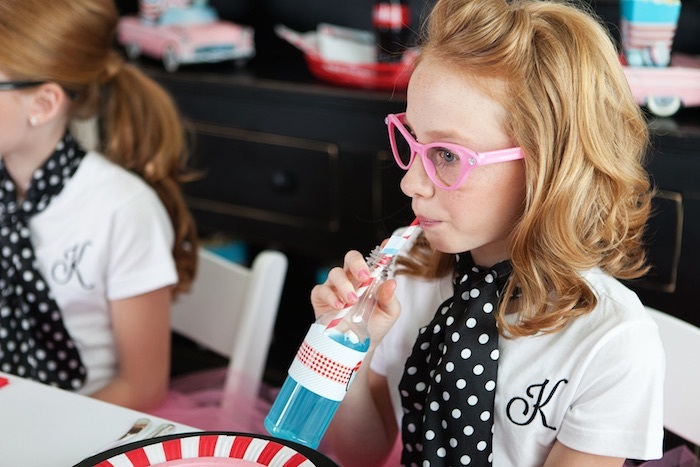 Fashion is one of the things that makes the 1950s so fun! 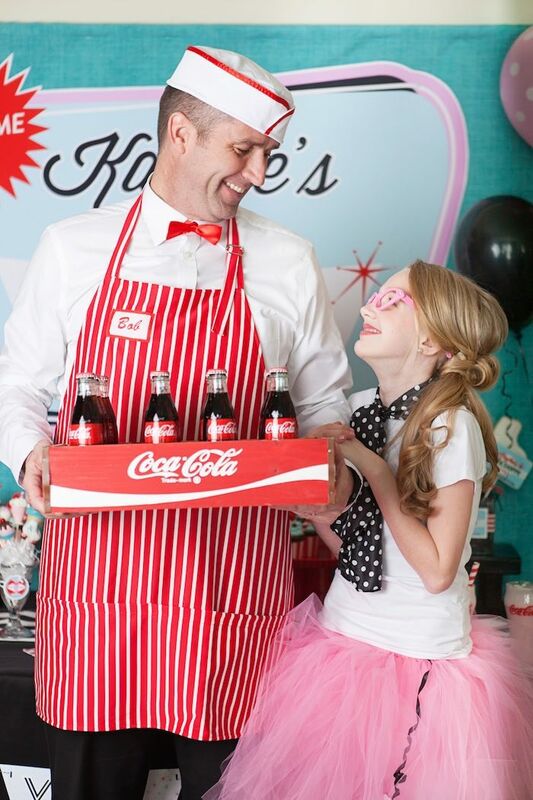 To really drive the theme home, and because girls love getting dolled up, we surprised each guest with an outfit to wear to the party! 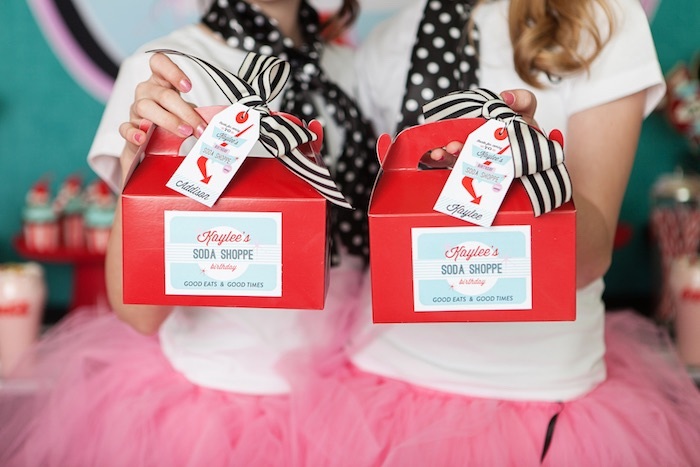 Attendees donned gorgeous poodle skirt inspired tutus made by the talented Atutudes with tulle from Nashville Wraps. 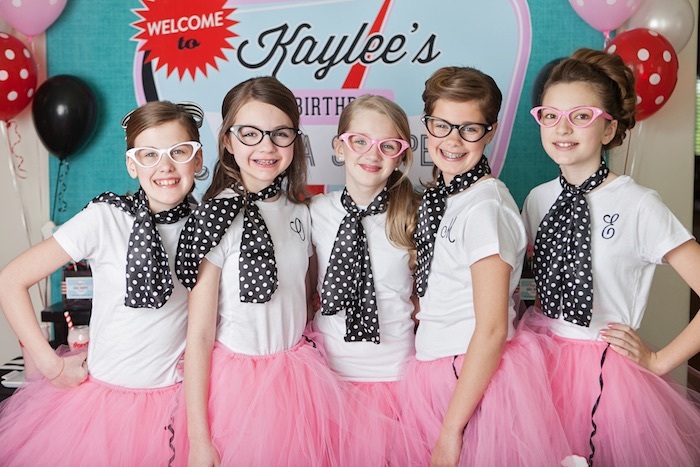 We thought this was a fun nod to the 50s without being as constricting as real poodle skirts while roller skating. Brenda of GreatStitch.com worked her magic and created 10 monogrammed t-shirts, one for each girl. 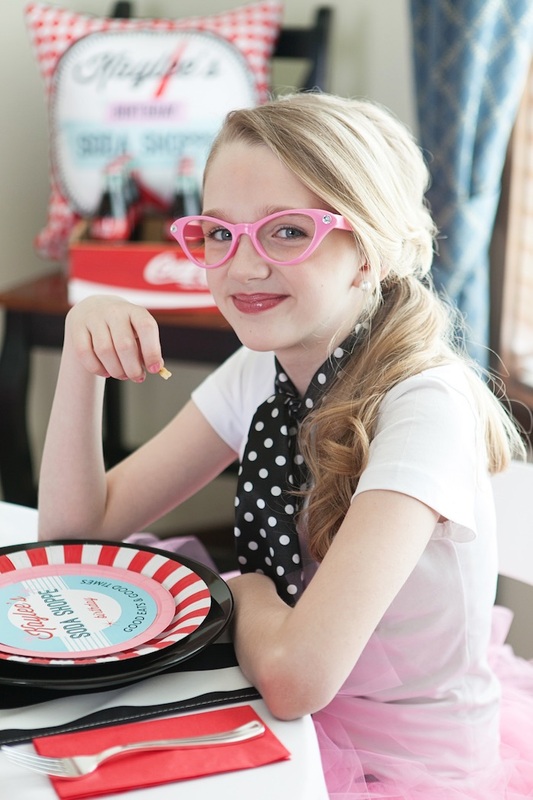 For some fun accessories, we gave each girl a polka dotted neck scarf (only $1 each) and added rhinestone accents to inexpensive cat eye glasses (also only $1 each) to complete the look. The girls were treated to custom hair styles, light makeup and fingernail painting in our own make-shift beauty school. 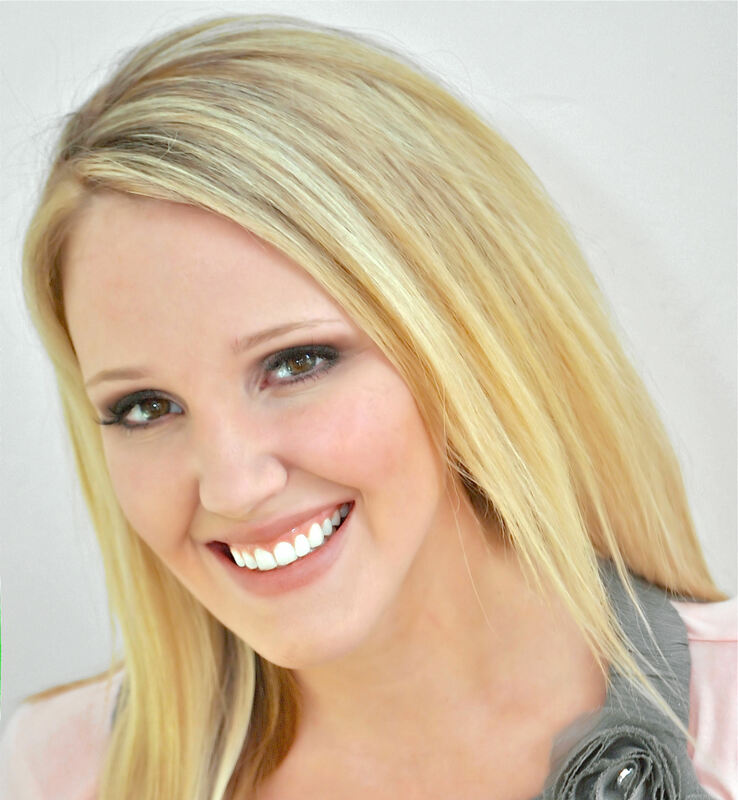 Fortunately, our stylist wasn’t a “beauty school dropout”. A big thanks to my amazing hairstylist friend, Tiffany Shakespeare, for sharing her talents and making over these beauties! 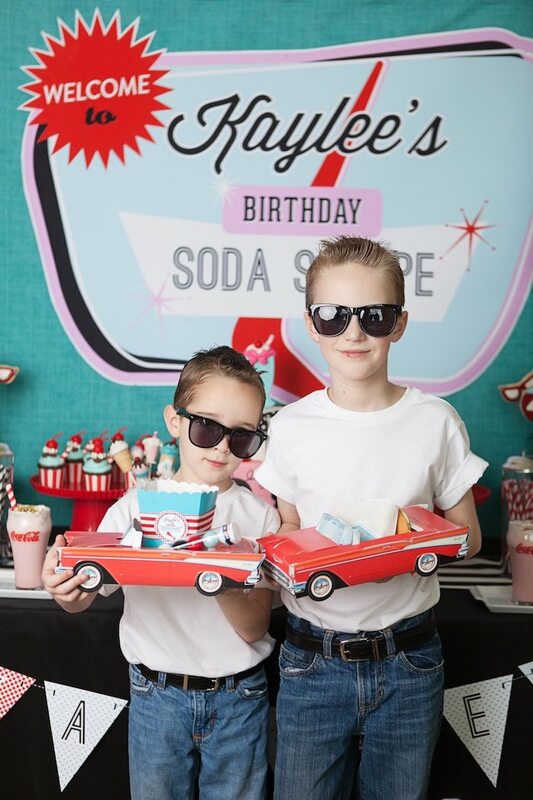 Even the guys got in on the dress-up action, with my husband stepping in to be our soda jerk, and my little boys playing totally cool greasers. 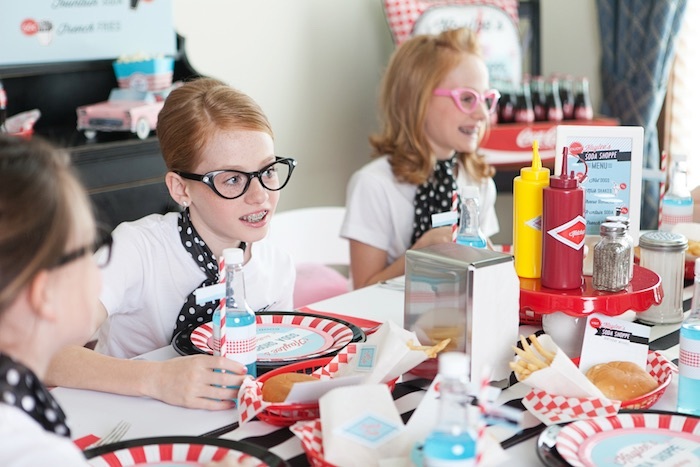 Everyone loved eating the diner inspired food. 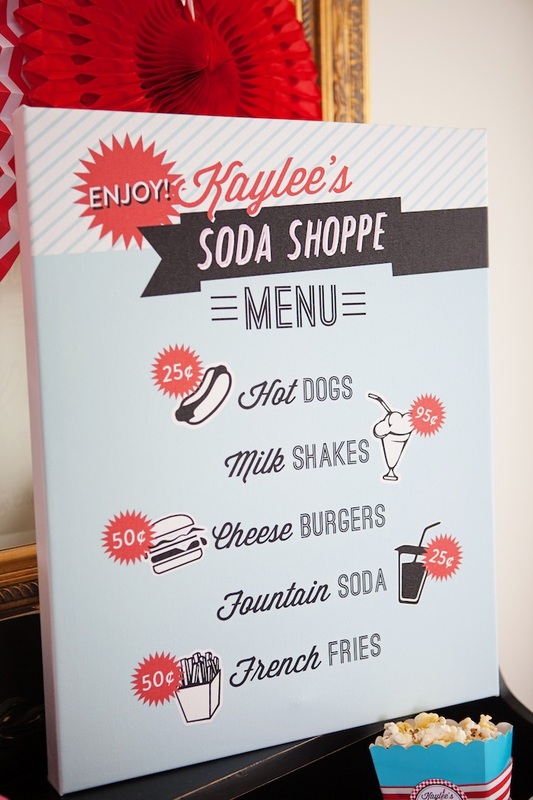 We kept the menu to a few basics: hamburgers (with or without cheese), hot dogs, fries, fountain drink/soda and fresh shakes + a few fruit and veggie options thrown in for good measure. My husband took orders on the guest checks designed by Anders Ruff and had each girl leave a sweet keepsake message on them for my daughter to enjoy after the party was over. 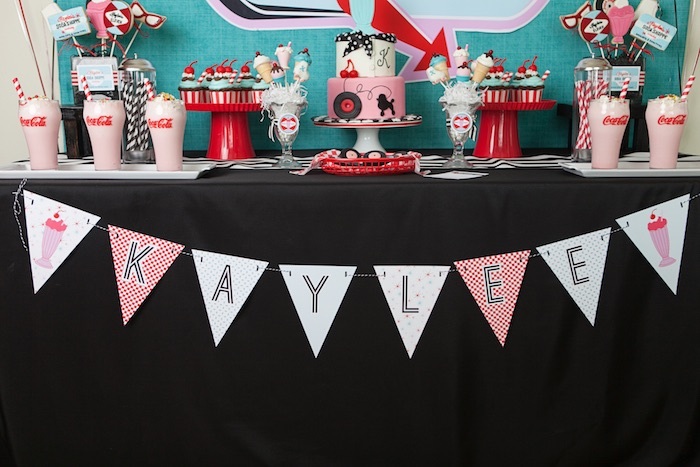 Dining tables were set with tablecloths from Wholesale Event Solutions and striped runners from Koyal Wholesale. 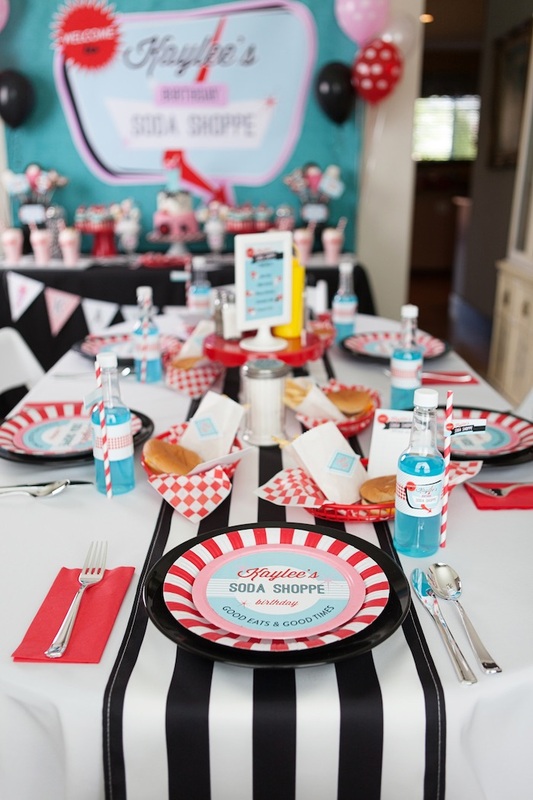 The centerpiece of each table was a small ode to 50s style diners. 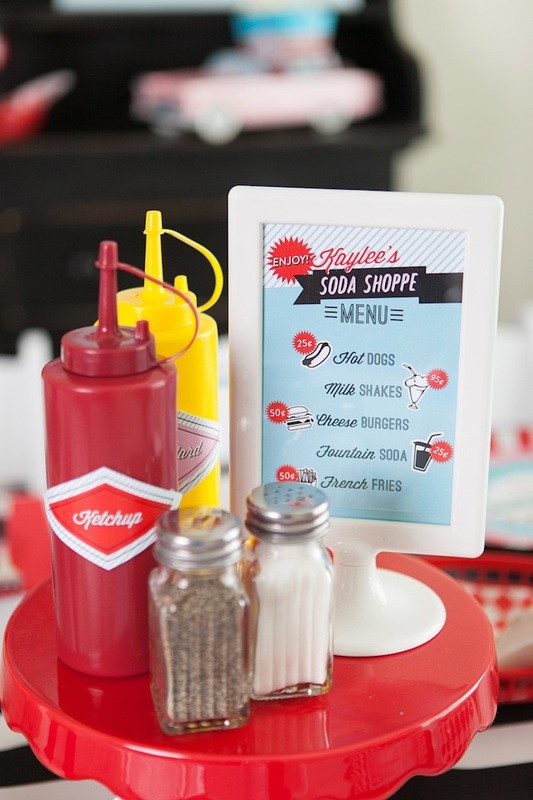 I paired a metal napkin holder and sugar shaker with a scalloped pie stand which held a small menu, ketchup and mustard bottles, and salt and pepper shakers. 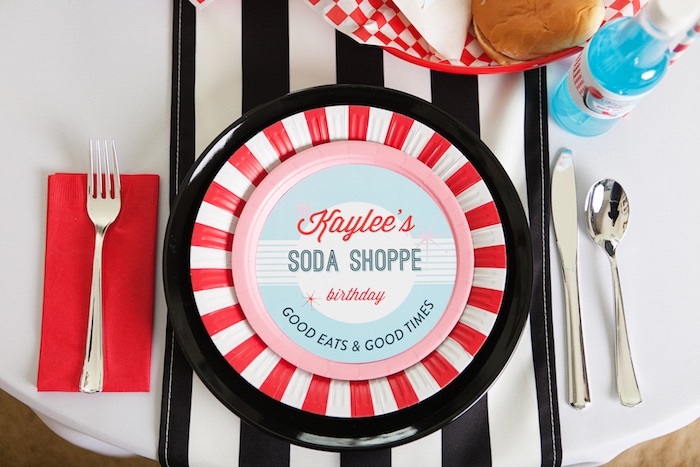 Place settings were made by layering black plates to look like vinyl record “45s” chargers with striped paper plates from Hoopla Events. 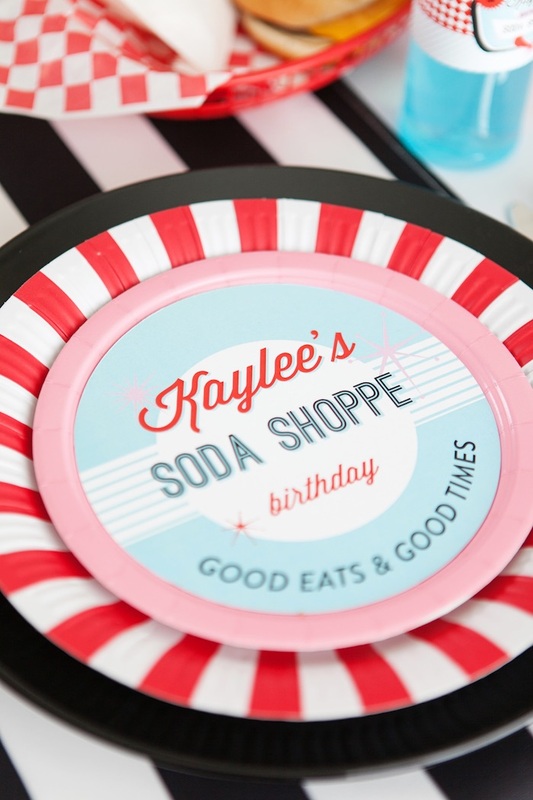 Each plate was personalized with the soda shoppe logo, a fun printable detail we had designed by Anders Ruff. 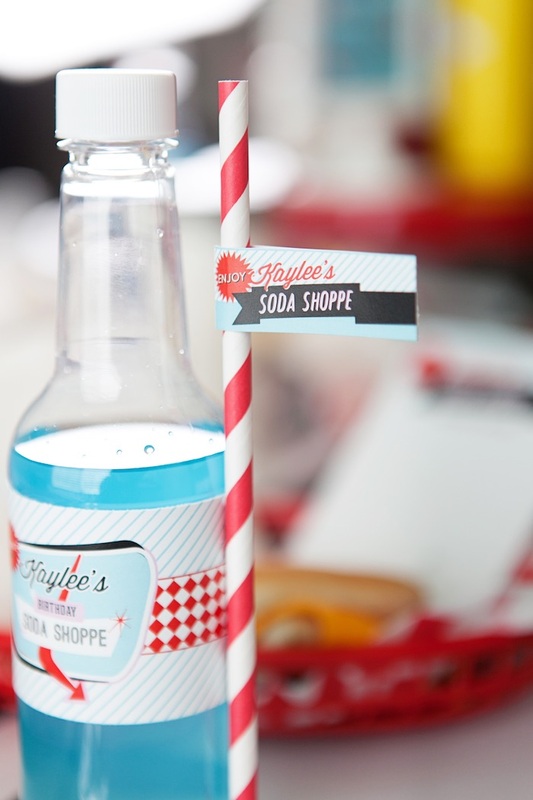 Reusable plastic soda bottles from Via Blossom also got a custom beverage wrap and party flag embellished striped straw (Hoopla Events). 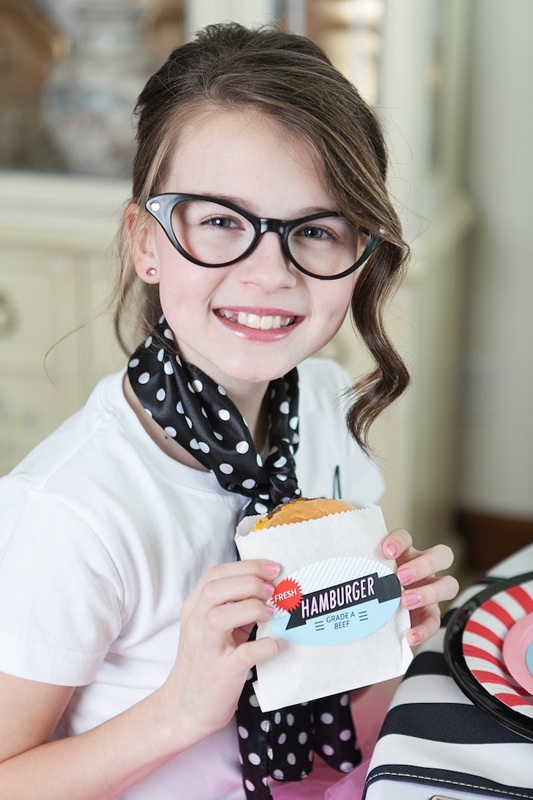 Retro burger baskets were lined with red and white checked food grade tissue sheets from Nashville Wraps. 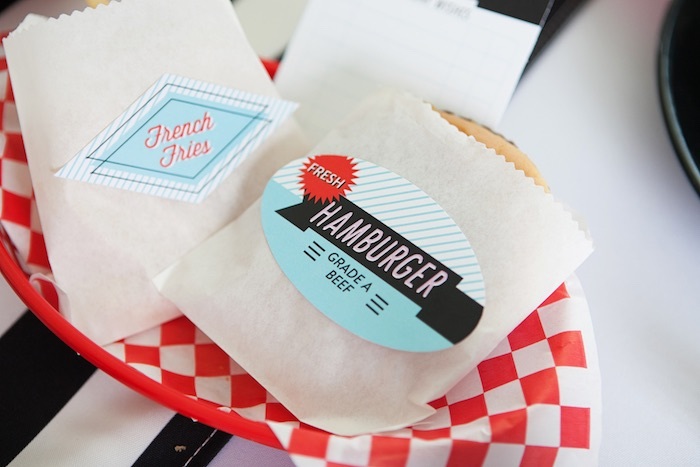 Burgers and fries were packaged in glassine bags with the cutest custom sticker labels from the Anders Ruff Diner Soda Shoppe 50s Retro Party Collection. Guest checks were included with each order. 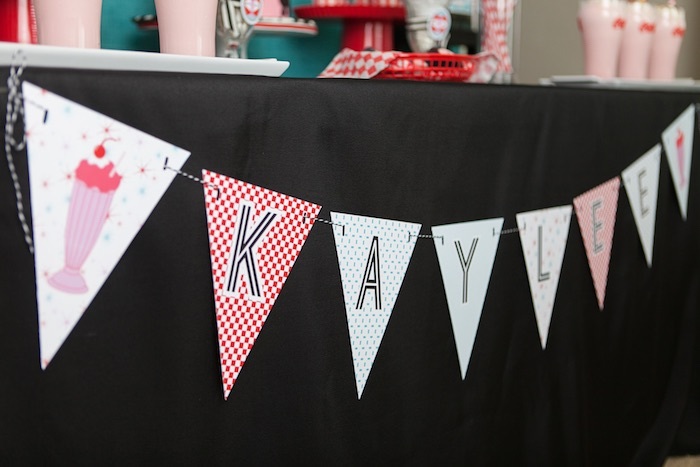 We loved this detail that allowed friend’s of Kaylee to leave her a sweet message. 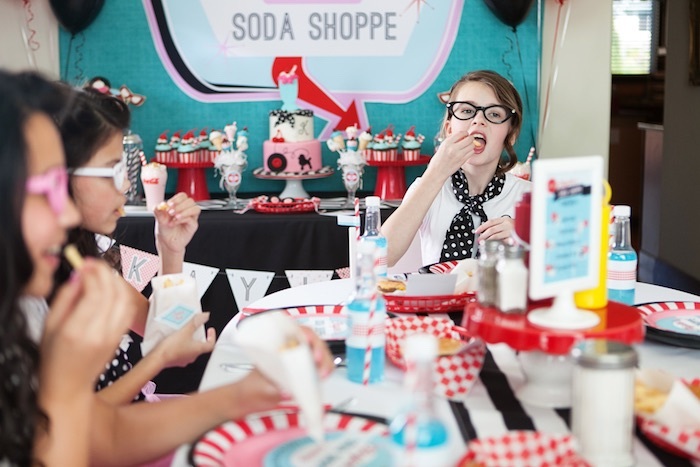 A retro soda shoppe party calls for an amazing dessert table! 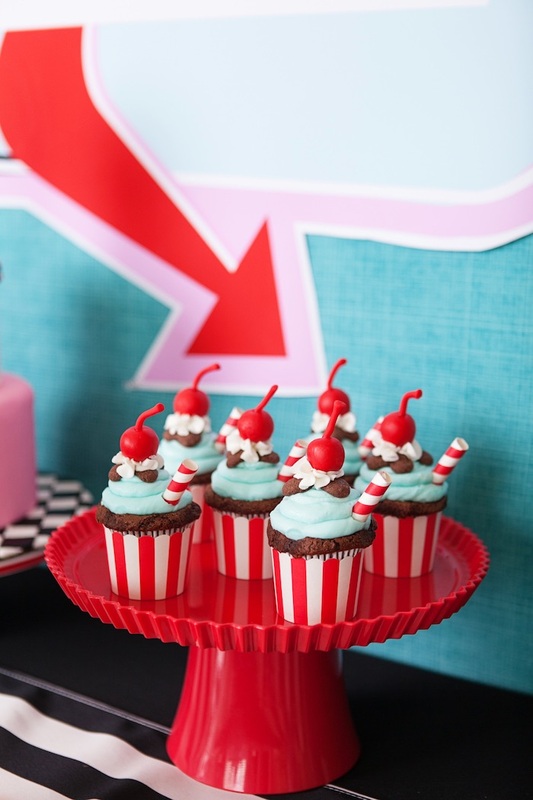 Using an oversized logo, inspired by diners and ice cream parlors popular in the 50s, I got to work building a fun table for retro inspired treats. 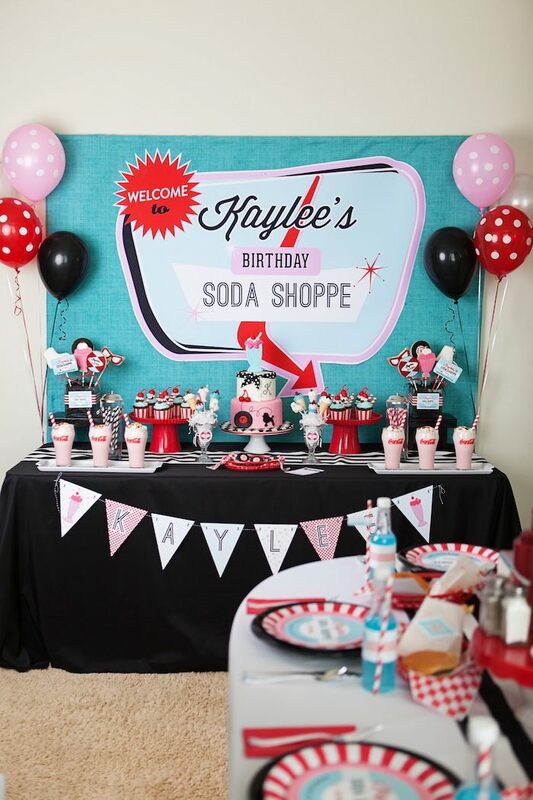 To dress up the table, we flanked each side with clusters of balloons from My Paper Crush and added a custom “Kaylee” name banner to the front of the table. 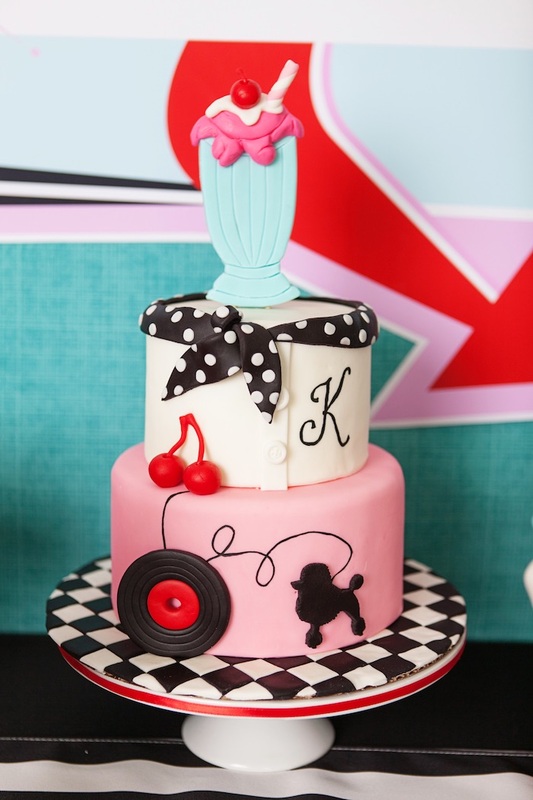 Christina of 4 Kids Cakes designed the most perfect cake, combining elements of the printable designs with elements of the girl’s’ costumes. Plus, how awesome is that checker board floor? Christina also knocked the cupcake design out of the park! 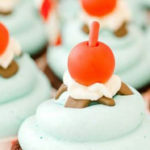 Aren’t those the cutest ice cream inspired cupcakes you’ve ever seen, complete with a fondant cherry on top? 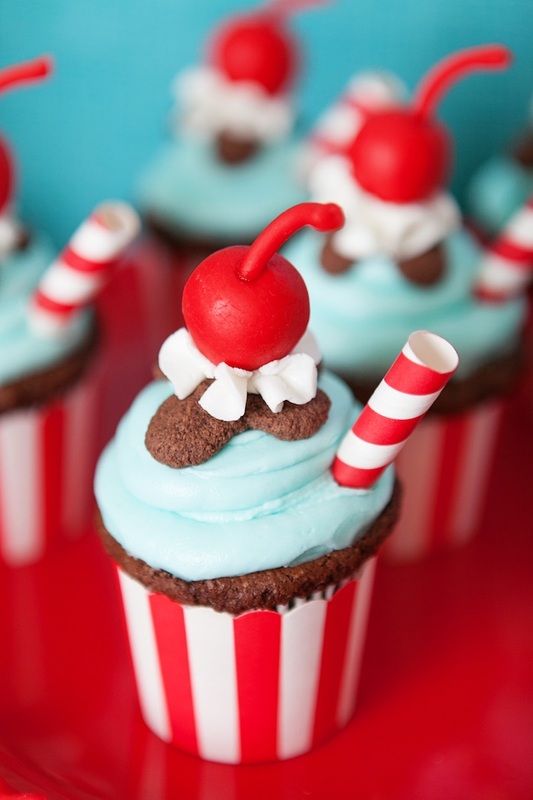 They looked adorable served up in baking cups from Hoopla Events. 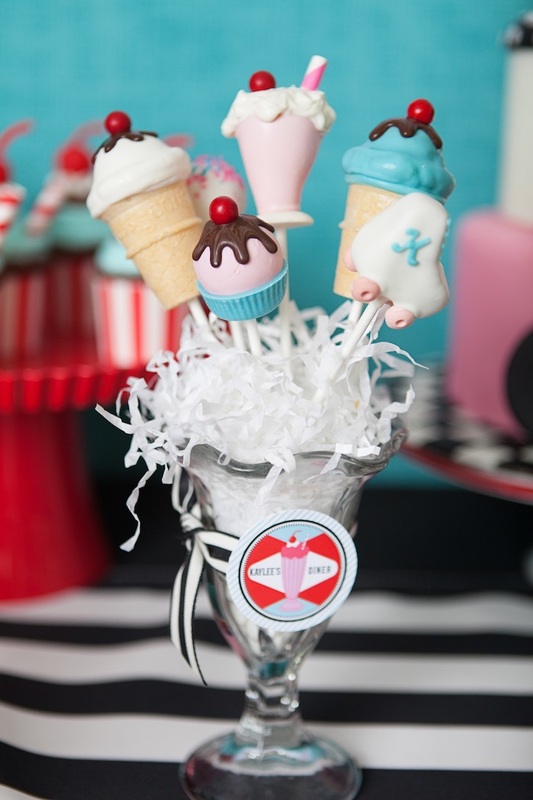 Sundae style glasses were used to creatively display soda shoppe themed cake pops baked up and decorated by . They just couldn’t be any cuter. 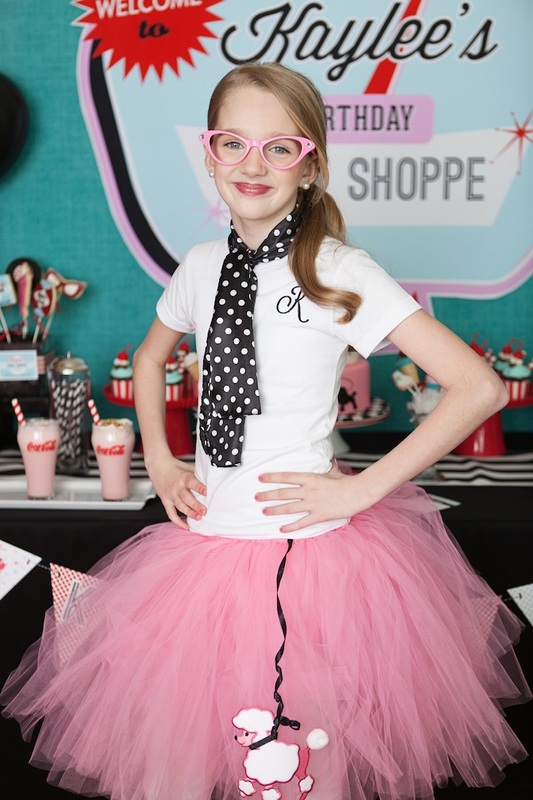 Cat eye glasses, rolle r skates, milkshake, record and logo cookie pops by Auntie Beas Bakery looked amazing displayed in square vases filled with paper shred. 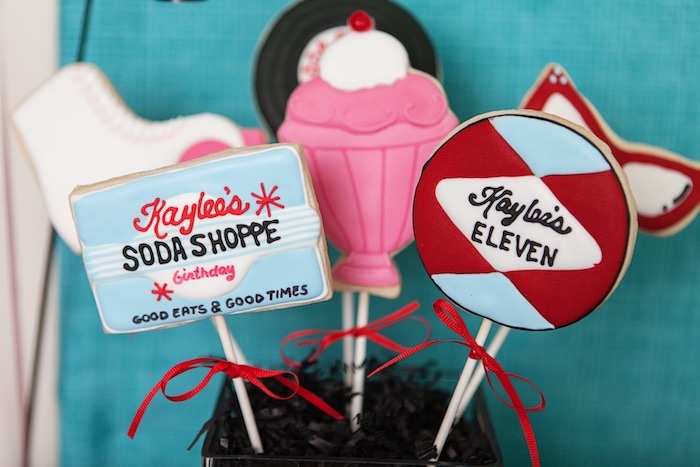 Bethany’s cookies are a favorite here! 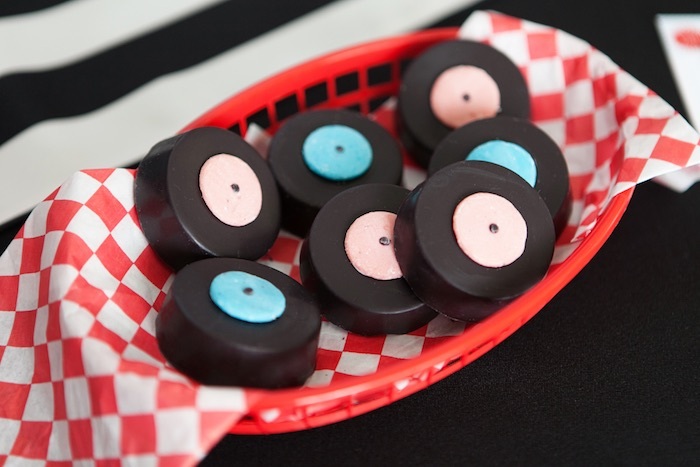 Morsels Parties came through in a big way, executing my idea to serve chocolate covered Oreos designed to look like vinyl records. They were snatched up and eaten in a flash! 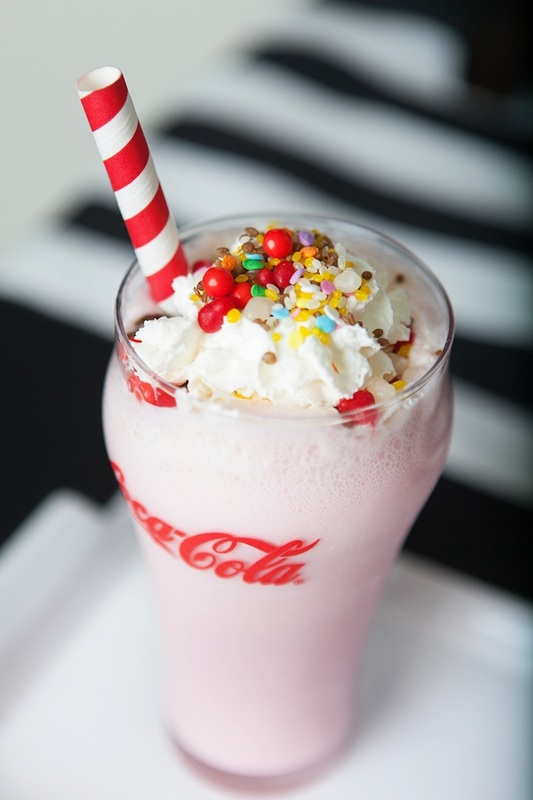 And last, but certainly not least, a retro soda shoppe definitely means milkshakes have to be served. 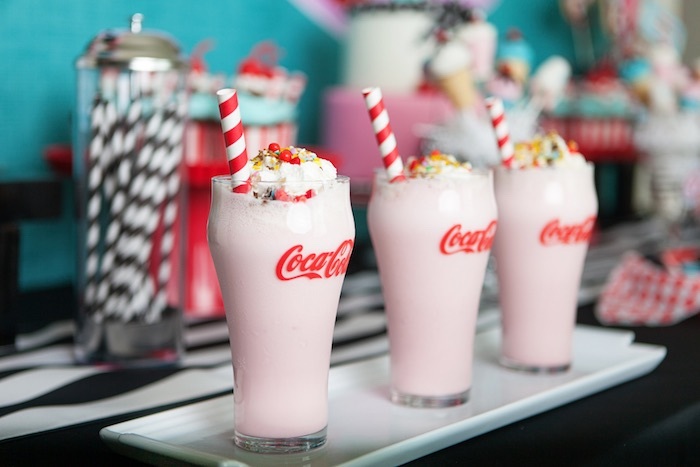 Fresh strawberry milk shakes were served in retro Coco-Cola glasses and then sprinkled with Candyfetti from Sweets Indeed. 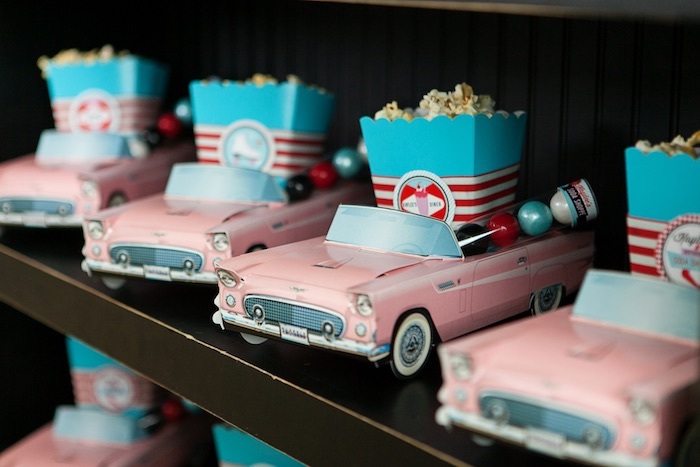 Sweets on sweets is never a bad thing, at least not in my book. After dinner and dessert, it was time to box up leftovers and party favors and head to our local roller skating rink. 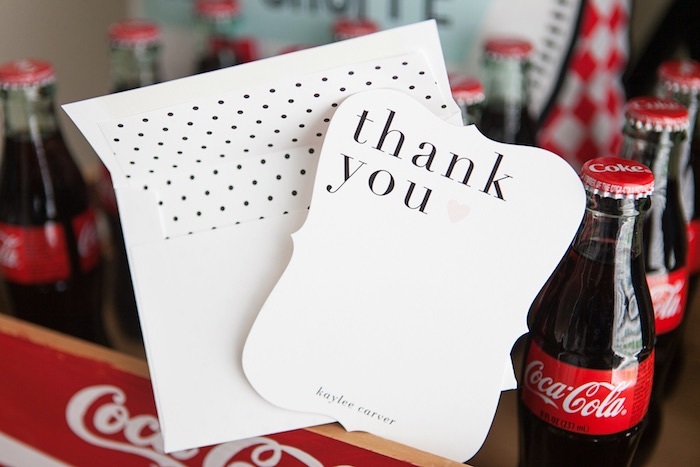 Each guest was provided a personalized “take home” gable box to wrap up their leftovers and tuck away a treat for later. 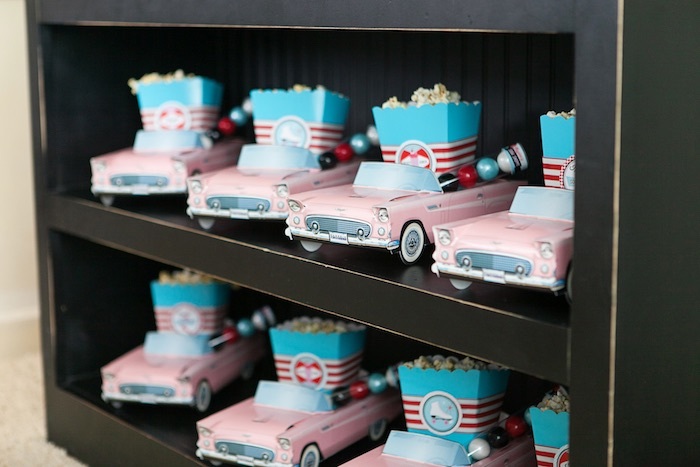 Attendees also grabbed one of the adorable retro car boxes from Via Blossom, which contained a small popcorn snack for the car ride and cute candy tubes from Hoopla Events filled with gumballs. 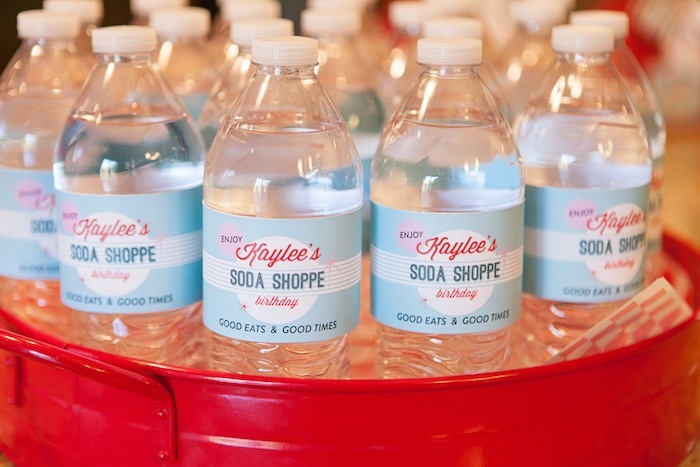 Water bottles with soda shoppe labels were taken in to the skating establishment to keep the girls all hydrated. 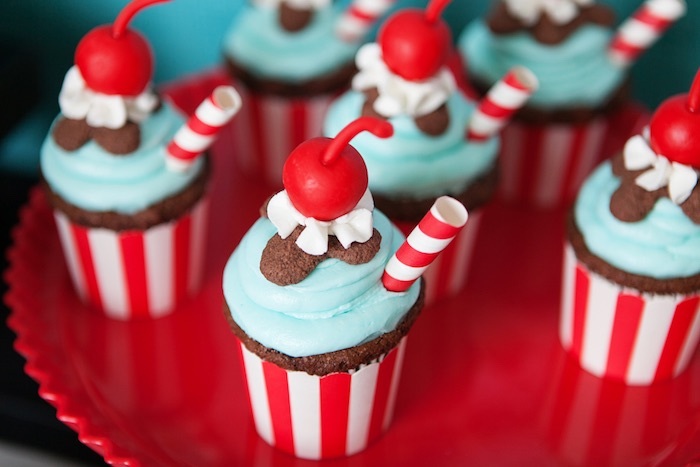 What a great idea, I especially love the cupcakes! 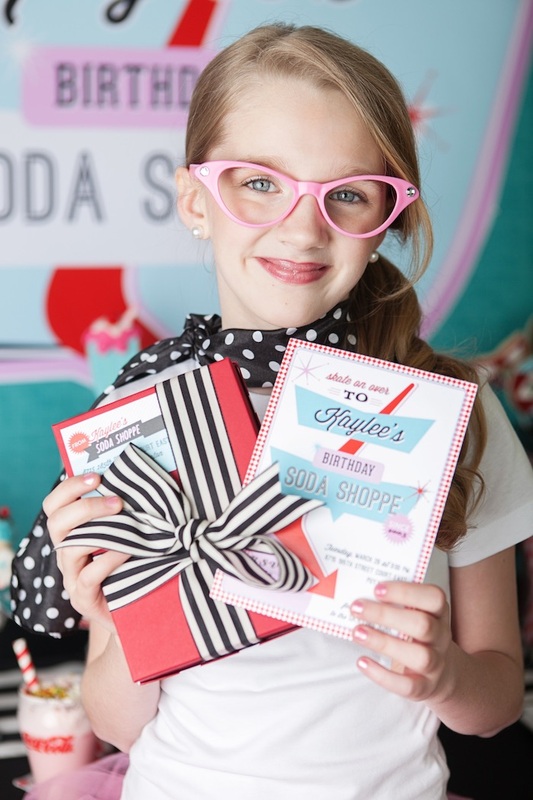 I have a similar blog, but I adore your ideas! Wow! You did a spectacular job. Cake looks amazing. Amazing idea!! Great job!! 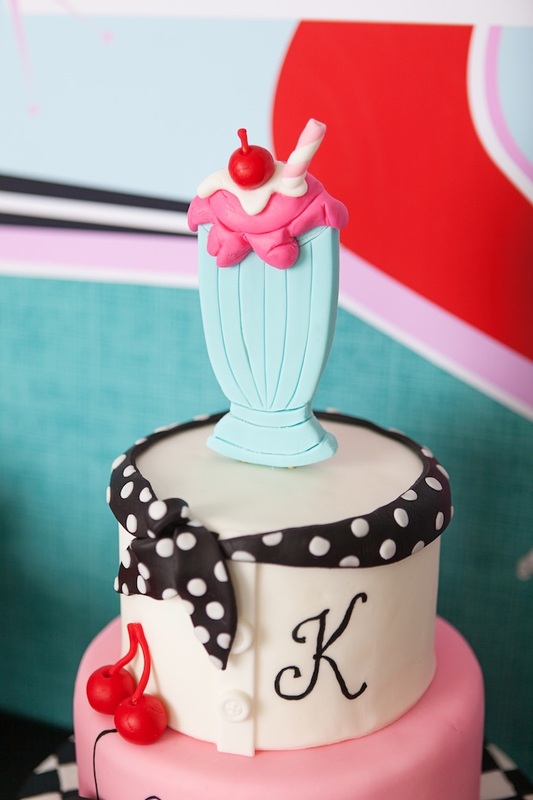 Love the cake design. Awesome cake design & decoration ideas!!! Love love love this idea. I’m doing something similar for my moms 60th birthday. 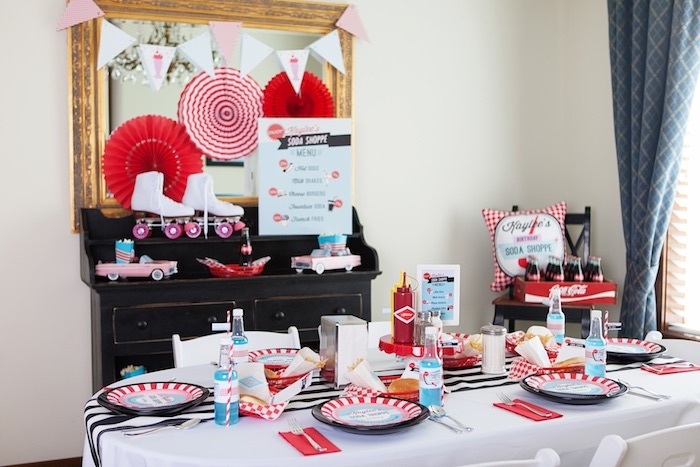 I cant seem to find picture frames and the red plastic cake stands anywhere. Can you tell me where you got these ones?